The final event in the 2018-2019 Science on Screen film-and-discussion series at the Midwest Theater will take place the first week of May, with a special co-hosted pair of events to celebrate Scotts Bluff National Monument’s Centennial. On Thurs., May 2, at 7:30 p.m., the Midwest Theater will present “Volcanic Ash in Western Nebraska: Past . . . and Future?” featuring two geologists and a disaster movie. Prior to the event, educational booths will be set up in the lobby for visitors to learn about geology, fossils, and preparing for natural disasters, featuring Scotts Bluff National Monument, Agate Fossil Beds National Monument, and Region 22 Emergency Management. This event is open to the public, and admission is FREE, thanks to event sponsors and partners, including Scotts Bluff National Monument, the University of Nebraska-Lincoln Panhandle Research and Extension Center, Scotts Bluff County Farm Bureau, WyoBraska Gives donors, Kelley Bean Company, Monument Inn & Suites, Nebraska Arts Council, and Nebraska Cultural Endowment. Every audience member will get a free ticket for a chance at winning a raffle prize. For more information about the Science on Screen program, visit the Midwest Theater website www.midwesttheater.com or call 308-632-4311. On Sat., May 4 at 10:00 a.m., Scotts Bluff National Monument will present “Geo-Journey at Scotts Bluff” featuring Swinehart and Evanoff leading a guided hike through the layers of geologic time at Scotts Bluff National Monument. The geologists will discuss the 35 million years of geologic history exposed at the bluffs and where to find evidence of volcanic activity along the Saddle Rock Trail. This event is part of Scotts Bluff National Monument’s Centennial celebration. “Geo-Journey at Scotts Bluff” is FREE and open to the public, but space is limited and registration is recommended. To register, or for more information, contact Kayla Gasker at kayla_gasker@nps.gov or 308-436-9700 x701. The event link for the hike is here: Geo-Journey at Scotts Bluff. WHEN: Thurs., May 2 at 7:30 p.m. WHEN: Sat., May 4 at 10:00 a.m. When James Swinehart moved to Nebraska in 1970, he didn’t plan on staying for long. 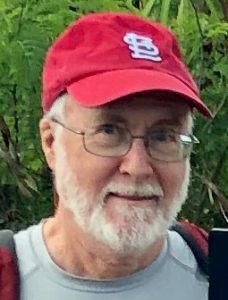 Forty years later, in 2010, he retired as a professor emeritus, having concluded a successful career as a research geologist in the Conservation and Survey Division, School of Natural Resources at the University of Nebraska-Lincoln. His career has focused on stratigraphy (the study of how rock and sediment layers—strata—are arranged in time and space) and sedimentology (the study of the origin, structure and history of sediments and sedimentary rocks). His research examined the evolution of the landscape and Cenozoic stratigraphy of both the surface and subsurface of Nebraska and the Great Plains, and the geologic history of the dunes, lakes and wetlands of the Nebraska Sand Hills and north-central China. Emmett Evanoff is an Associate Professor of Geology at the University of Northern Colorado where he teaches a variety of courses in sedimentary geology, paleontology, and Colorado geology. He has also taught adult education courses in paleontology and geology at the Denver Museum of Nature and Science. He received his bachelor’s degree at the University of Wyoming, and his masters and doctoral degrees at the University of Colorado in Boulder. 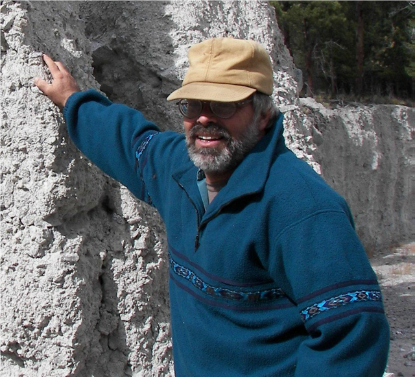 His research interests include the timing, origin and ancient environments of sedimentary rocks derived from volcanic ash that fell over the Rockies and Great Plains approximately 50 to 30 million years ago (Eocene and Oligocene rocks). He has worked on these rocks and their associated fossils in Colorado, Wyoming, Nebraska, and South Dakota, and is currently working on the geology of Badlands National Park and Scotts Bluff National Monument. A vulcanologist arrives at a countryside town recently named the second most desirable place to live in America, and discovers that the long dormant volcano, Dante’s Peak, may wake up at any moment.